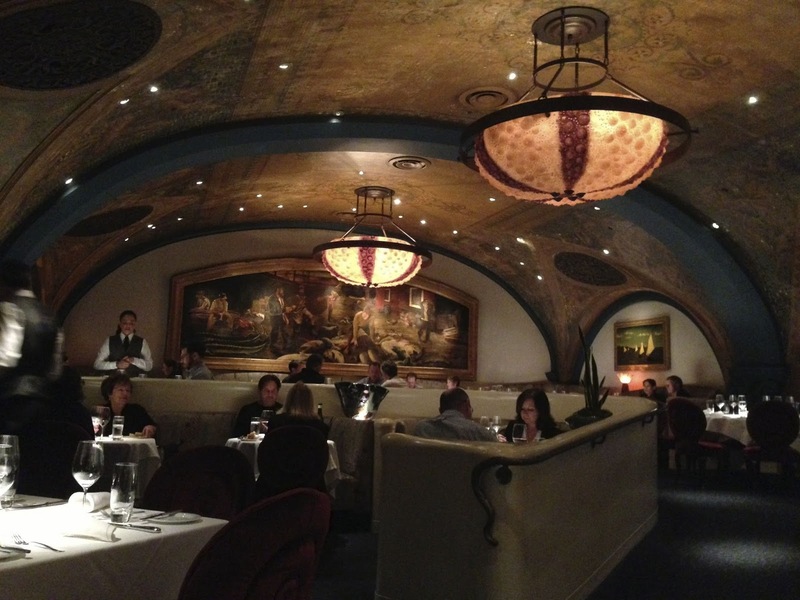 I have reviewed Farallon before. 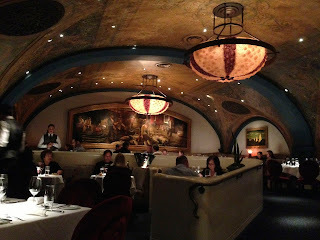 Located in the tourist hotspot of the Union Square in San Francisco, this restaurant seems to be one that would be comfortably at home in Las Vegas or Atlantic City with its elaborate and whimsical ocean motifs and cavernous interiors. 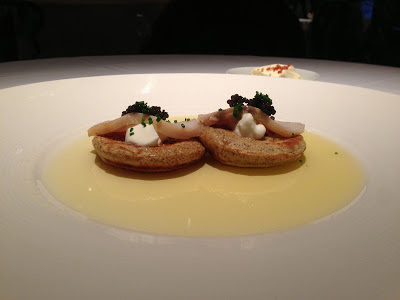 The food is pretty good too, even if not mind-blowing, and that is what I went back for during a recent weekend. 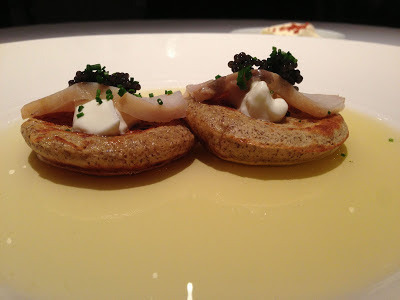 Executive chef Mark Franz is in charge of the menu, and I decided to try his prix fixe option for the night which turned out to be a good idea. My waiter quickly put some bread and butter as he took my order. 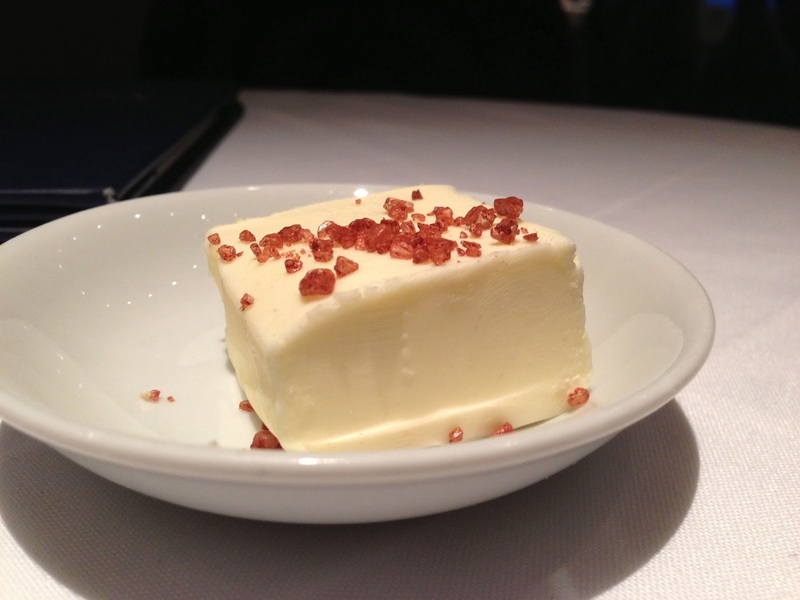 The butter was sprinkled with Hawaiian sea-salt of a reddish-brown color. They started off by serving me an amuse bouche: wild mushroom bisque with truffle oil served in a small espresso cup. 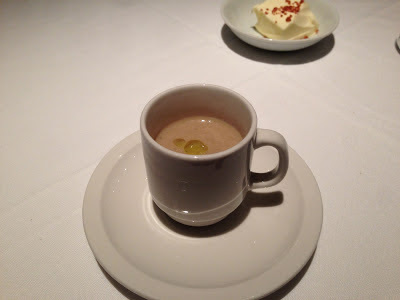 The bisque was perfect - very rich and flavourful! Then came the first course of the menu: house smoked sturgeon and American paddlefish caviar on buckwheat blinis with creme faiche and drawn butter. Ah, that sounds decadent, doesn't it? The contrasting burst of flavor, texture and taste on the palate were very interesting. The crisp Massachusetts black bass was served quickly after. 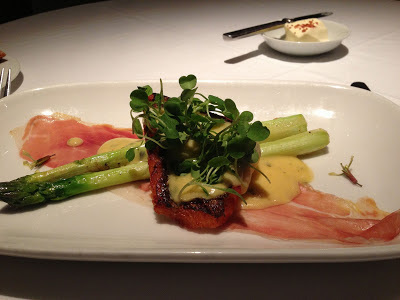 The fish was served on a thin sliver of Serrano ham and some jumbo asparagus and sauce maltese. I loved this one. Up next, was the seared Georges Bank diver scallops. 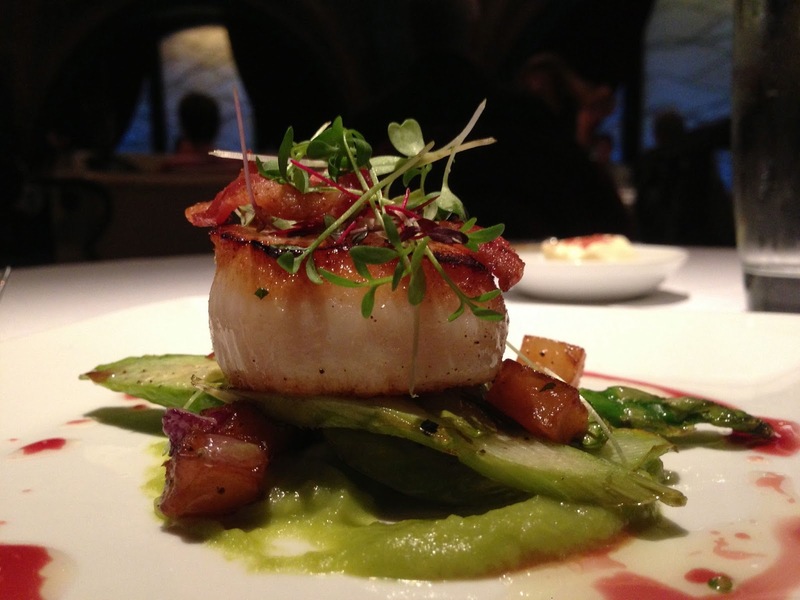 The large scallop was served on a bed of green garlic puree and served with duck fat potatoes and a petite bacon salad. This dish was a winner! The scallop was squeaky fresh and the ingredients worked very well together. I have been recently off beef, so I had requested the waiter to see if the chef would substitute another dish. They did! 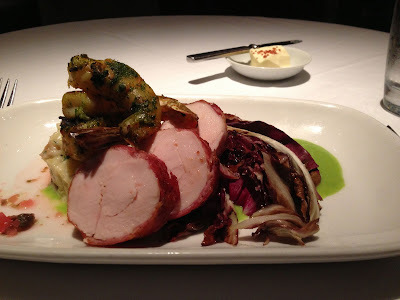 So I had the Pork Schnitzel with cabbage slaw, roasted cauliflower gratin and topped with shrimps. 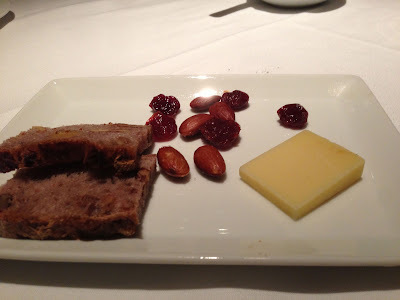 They served a small serving of goat cheese with sweet almond bread and preserves before the dessert. 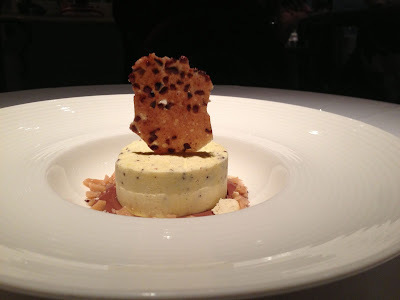 The dessert itself consisted of a Cocoa Nib Semifreddo with oyster stout milk chocolate sauce and oyster cracker brittle.